Ichabod is a member of the Galactic Nitpicker's Guild. That means he's a man who wanders the galaxy charging people good money to have him tell them all the things they're doing wrong. That may sound silly to you, but this is THE FUTURE: when people are willing to pay top dollar for that sort of thing. Still, Nitpickers aren't known for being terribly popular people, and Ichabod is no exception. He's hardly a social butterfly - what with the whole "career built around criticizing others" thing - and he's got a very low opinion of people in general. In fact, the guy's just kind of a grouch. If you're actually willing to take the time to know him, though, Ichabod's not a bad sort of fellow. After all, he DOES offer free passage around the galaxy to folks in need... from time to time. Ichabod is a tough cookie to figure out. Depending on when you catch him, you might think he's an egomaniac who's completely full of himself, a pathetic man-child with crippling insecurity issues, or just an unstable lunatic. The truth probably includes all of these opinions and much, much more. Most people who have "gotten to know" Ichabod actually gave up trying to figure him out a while ago. It's much easier to just shrug and go along with him (or stay out of his way). Like any Nitpicker worth his salt, Ichabod is a highly intelligent individual with a keen eye for detail. He has a sharp memory, a knack for thinking outside the box, and a habit of being several steps ahead of everyone else, other common nitpicker traits. Ichabod ALSO has a habit of making things more complicated than they really need to be, which is not a common Nitpicker trait, it's just something he does. What's more, while he's pretty good at nitpicking OTHER people's mistakes, Ichabod has a nasty habit of failing to notice his OWN boneheadedness until it's much too late. This has given him an unfortunate reputation for... sowing discord, if you will. Q: Ichabod's always talking about weird stuff that's happened to him. What's his backstory? A: Ichabod's life story is such a vast, sprawling web of strange events and weird anecdotes that I couldn't possibly sum it up in one place. It's far better to break it up into brief anecdotes and sprinkle them at random throughout the comic. Q: In other words, you don't know his backstory, so you're making it up one bit at a time? A: Pretty much. Characters like Ichabod are funnier when you don't really know where they're coming from, so I'm deliberately leaving large portions of his history blank. We DO know that he spent a portion of his childhood around a traveling clan of Jesus Freaks, and we know he's been at the center of many disastrous events since becoming a professional Nitpicker. Also, he seems to know quite a bit about the even more mysterious Stilez and Vengeance. But if you want more details than that... I'm afraid I only discover these things myself when I write them into comics, so you know as much as I do. Q: So, how does the Nitpicker's Guild work, anyway? A: Against everyone's reasonable expectations, that's how. In theory, there's a clear hierarchical structure, with upper level Nitpickers calling the shots, then middle management types assigning specific jobs to the "ground level" Nitpickers in the field. In PRACTICE, however, everybody pretty much does their own thing. These are people who make a living pointing out what other people are doing wrong, they don't take direction very well. Officially, prospective clients request a Nitpicker from the Guild, who assigns a specific Nitpicker whose talent and experience makes him best suited for the job. In actuality, the Guild rarely gets involved in assigning jobs unless it's something nobody wants to do. Otherwise, they just post new jobs on the Guild database, and whoever grabs it first (that is, whoever happens to be in the neighborhood) gets "assigned". Also, most Nitpickers take additional "freelance" Nitpicking jobs that didn't go through the Guild at all. Technically, this outside work is forbidden, but the Guild never punishes anyone for it. HOWEVER, the Guild won't take any action to rescue a Nitpicker who's gotten into trouble on a freelance job. Since most Nitpickers rely on the Guild to get them out of whatever messes they inevitably create for themselves, that's a risky gamble right there. As disorganized as the life of a professional Nitpicker may be, the road to becoming a Nitpicker is far more ordered and rigorous. The Nitpicker's Guild operates a Nitpicking Academy to train young minds in the ways of spotting errors, or more accurately to discourage and scare off all but the most die-hard applicants. Upon enduring a sufficient number of classes, the remaining hopefuls are sent into the field to train with professional Nitpickers. This can last anywhere from a few months to several years, until the Nitpicker in question either sends the trainee back to the Academy or grants them full certification as a guild member. Just about every Nitpicker with more than a few years under their belt has a trainee following them around... except Ichabod, because come on, you KNOW he's not that good with kids. Q: So, how old IS Ichabod, anyway? Q: Why does Ichabod wear those stupid giant glasses? It doesn't look like he can even see through them. Nobody else has glasses that look like that, so what's his deal? A: Ichabod is a weird, weird person, and he refuses to be dissuaded from his weirdness. If he wanted, he could probably get smaller glasses, or probably even some kind of future eye surgery so that he didn't need ANY. But darn it, he decided he liked these giant, opaque coke bottle glasses, and nobody's gonna change his mind on it now. Q: What about the ship? Other people talk about owning their own spaceships, and we've seen people flying stuff themselves. Why does Ichabod need Captain Crosby to fly him around? A: Pretty much the same thing as the glasses. Ichabod's decided that owning a ship himself would be more trouble than perpetually renting out someone else's ship, and nobody's gonna change his mind on the matter. Q: Wow, Ichabod sounds like a really stubborn, set-in-his-ways kind of guy. How did he end up being a Nitpicker? A: Hey, just because a guy can't take criticism himself doesn't mean he can't dish it out to other people! 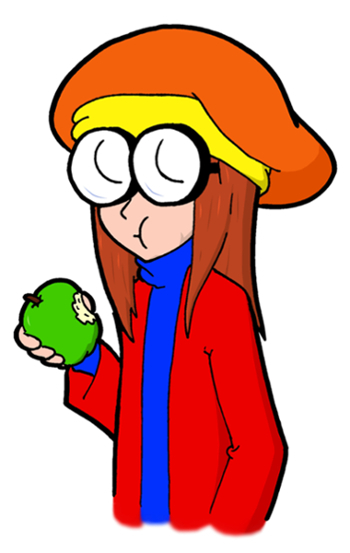 Q: Okay, the apples. Why all the apples? A: It's an in-joke that only five people on this planet will EVER understand. NO I'M NOT GOING TO EXPLAIN IT. NOW I'VE BUILT IT UP SO MUCH THAT THE TRUTH WOULD JUST BE A LETDOWN.